Having a unique IP address for your web site will cost you a few extra rupees a month but it is undoubtedly worth it. It is therefore absolutely imperative to obtain inbound links that point to your web site and to content pages within your web site. The links that are most beneficial are one-way inbound links: links that point to your web site without your web site linking back. Google considers these the most genuine endorsements and therefore the most reliable indicator of a page's objective usefulness. How much weight Google will give to a link depends on the page's PageRank and on whether the link's target page is related to the content on the linking page. In other words, a link pointing to a page about PRINTING is worth more if is in a page about PRINTING; if the link is on a page about cars, it will be less beneficial. A web site's traffic should grow exponentially once a certain critical level of traffic is reached, because the more people visit your web site, the more incoming links you will get, the higher your ranking will be, which in turn will bring in more traffic - assuming, of course, that your web site offers value to its visitors. Posting a cool video is an excellent way to gain exposure. 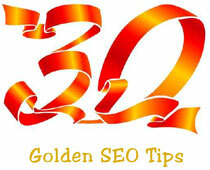 Make sure all such links have anchor text that is a highly focused on the target page's content. Not all forums make this possible, but I have seen several that publish posts as HTML pages and that allow links. Of course, make sure that you write quality posts that add value to the forum, or your posts will be considered spam. Also, the outbound links will be worth more if they are embedded within a good chunk of quality text. A great way to obtain one-way inbound links is to broadcast a press release through an online service. Make sure that your press release is well-written and interesting, and of course make sure that it has a link to your web site. If you link to a web site that Google has penalized or that for some other reason Google considers to be a bad web site, your web site will be penalised. Google will not penalise you if a bad web site links to you, but it will penalise you if you link to a bad web site. For this reason you should only link to the best web sites, and you should check those links frequently to ensure that the web site does not have a new, spammy owner (it can happen). You should avoid so-called bad neighborhoods. Bad neighborhoods are clusters of interlinked web sites that are suffering a Google penalty (maybe without even realising it). If you link to a web site which in turn links to a penalised web site, you are part of a bad neighborhood. Avoid this like the plague. One-way inbound links are essential to SEO. The only reason anyone will ever link to you is if you have something useful or interesting on your web site. I have already stressed the importance of writing great content. The third vital element in search engine optimisation is avoiding anything that is even remotely spammy or unethical. You should follow Google's Webmaster Guidelines scrupulously. If you do any of the things banned by the Google Webmaster Guidelines, sooner or later Google will find out and penalise your web site.